and back of the sweater will give a feminine look to it. 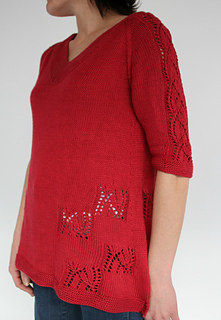 The sweater is knitted from top down, seamlessly. You start by knitting collar garter flat with short rows and at the same time you will increase the raglan sleeves. a- Bust circumference: 30 (34, 38, 42)46, 50, 54 inches; 75 (85, 95, 105) 115, 125, 137 cm. e- Upper sleeve circumference: 10½ (11½, 12½, 13½) 15, 16.5, 17½ inches; 27 (29, 31, 34) 37, 42, 43¼ cm. Yarn: approx. 1095 (1095, 1205, 1315)1565, 1695, 1840 yards; 1000 (1000, 1100, 1200) 1430, 1550, 1680 meters of sport yarn or other yarn for obtain gauge. Needles: US 2½; 3.00 mm, US 4; 3.5 mm circular needles and dpns. Others: Stitch markers, waste yarn. Une jolie dentelle sur les manches, et un rappel sur le devant et le dos du pull donneront un air très féminin à celui-ci. a - Tour de poitrine : 75 (85, 95, 105) 115, 125, 137 cm. d- Longueur de l’emmanchure à l’ourlet : 42 cm. e- Circonférence des manches : 27 (29, 31, 34) 37, 42, 43¼ cm. Laine : approximativement 1000 (1000, 1100, 1200) 1430, 1550, 1680 mètres de laine de type sport ou autre pour obtenir l’échantillon. Aiguilles : aig circulaires et double pointes 3.00 mm et 3.5 mm.